Doughnuts . . . or donuts? 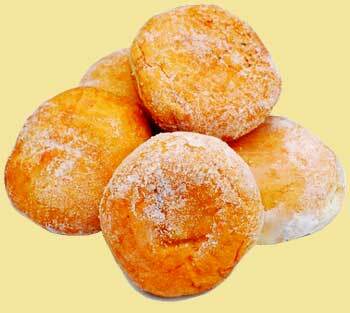 After last week's column for the Lardy cake, requests hace come in for another great yeast product, doughnuts. But just where, when and how did they first come about? There are many stories of their origin but if you would like to know my favourite one (I of course cannot verify its authenticity but it does make for a good yarn) read The origins of Doughnuts. But if you want to make doughnuts at home without the need for an expensive machine the recipe below can be used. Before staring you might consider reading the page for tips on using yeast. Join me next week when I share with you another recipe for a Churro, a Mexican version of a doughnut that is yeast free yet very, very light. They can be served sweet or savoury. To place your favourite jam or jelly filling inside a doughnut you will need a piping bag with a small nozzle, but the cake decorating syringes I find do work better. Simply place the jam in the bag or syringe, push into the centre and fill as required. To ensure the nozzle does not clog up strain the jam through a sieve first to remove the pips. Besides your favourite sweet fillings why not try making small Doughnuts filled with your favourite paté (thin it down by beating in some cream so it is pipeable) and instead of rolling them in sugar roll them in finely grated parmesan cheese. Four small ones to a portion means you can place three in the centre of the plate with another on top, maybe drizzle or serve with melted port wine jelly or cranberry jelly and finish with a sprig of mint for a colour contrast. To glaze the doughnuts / donuts combine 4 parts icing sugar with 1 part cornflour and drizzle in sufficient water and stir to form a glaze, but take care as very little water is required. This may then be coloured and/or flavoured with your favourite essences. For a chocolate glaze, replace the cornflour with cocoa powder or just melt some chocolate and dip, spoon or drizzle on top and finish with your favourite sprinkles. Enjoy your Doughnuts and bon appetit . . . . .